Boss Rob Page is satisfied with his team’s 11th place position in Sky Bet League One after the opening six matches of the season - but is frustrated the Cobblers aren’t sitting even higher. 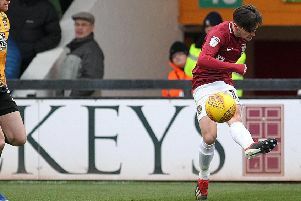 The Cobblers drew their opening five league matches of the season, but then claimed their first win of the campaign in front of the Sky Sports cameras last weekend, seeing off Milton Keynes Dons 3-2 at Sixfields. We know we are a few short of where we should be, or where we could be. That is the expectation and standards we put on ourselves as a group, and the first two home games in the league were disappointing. Page feels that where a team sits after six games is a fair barometer of how they are going to fare over the season, but believes there is more to come from his squad. “After six league games, and it is easy for me to say it after a win, now is a good time to see a true reflection of where you are at,” said the Cobblers boss. “And trust me, I would still be saying that if we had got beaten on Sunday. “So six games in we are sat in mid-table with the points we have picked up, and in the staff room and changing room we know we are a few short of where we should be, or where we could be. “That is the expectation and standards we put on ourselves as a group, and the first two home games in the league were disappointing. “If we had replicated Sunday’s performance against the other two teams then we would have won those games, but that’s how it is. “Through the course of the season we will go away and play well and pick no points up. “Then at home sometimes you won’t play so well and you will win games, and it evens itself out over the course of the season. “It is getting the balance right, and thankfully on Sunday both aspects of the game came together for us. “I thought defensively we were well organised. Our shape from front to back, and how narrow we were, frustrated them into playing longer balls which either went through to Smudge (Adam Smith) or went out of play. The Cobblers are back in league action on Sunday when they host Walsall at Sixfields. Page is set to have a fully-fit squad to pick from, with John-Joe O’Toole available after serving a one-match suspension and also getting over an ankle strain, while Gaby Zakuani is back from international duty with the Democratic Republic of Congo. That means he will face a bit of a selection headache, with one decision to be made whether to hand new signing Paul Anderson his second start. The winger started in Sunday’s win over MK and played his part in the victory, but Page says there is a lot more to come from the former Nottingham Forest and Ipswich Town man. “That is the most minutes Ando has played in nearly 12 months and I thought his input was exceptional against MK Dons,” said Page. “Understandably he was a little bit tired towards the end of the game, which is why I put Sam on, just from a physical point of view and the energy he brings because Brendan (Moloney) needed a little bit of help as well. “But that is only his first game and Ando is going to get better and better.